Bialik earned a BS from UCLA in 2000 in Neuroscience and Hebrew & Jewish Studies, and went on to the Ph.D. program in Neuroscience, also at UCLA. She completed her doctorate in the Fall of 2007, which examined the role of oxytocin and vasopressin in Obsessive-Compulsive Disorder in adolescents with Prader-Willi syndrome. Bialik was a dedicated student leader at UCLA Hillel, leading and starting a Women’s Rosh Chodesh group, chanting and blowing shofar for High Holiday services, and conducting and writing music for UCLA’s Jewish a cappella group……Bialik proudly breastfed her sons for a combined 6 1/2 years and is a Certified Lactation Educator Counselor, offering free counseling and lactation support to any woman who is referred to her. Her book about Attachment Parenting, Beyond the Sling, was published in March 2012 (Simon and Schuster). Her second book of vegan family-friendly recipes, Mayim’s Vegan Table, was published by Da Capo Press in February 2014. 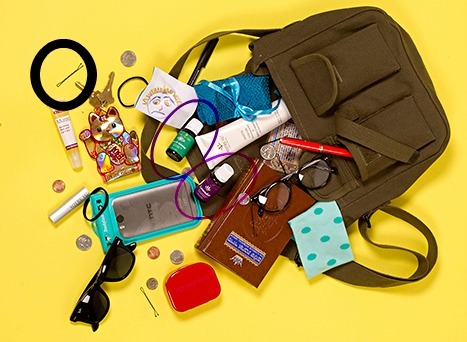 So when I came across this photo of What’s in Mayim Bialik’s purse posted on US Weekly I was so happy to see that out spilled 2 oils from Young Living. When you are Mayim Bialik you need a little bit of Peace and Calming and Lavender.